Par Fundaexpresión, partenaire Femmes2030 de la Coalition mondiale des forêts en Colombie. Le rôle fondamental que jouent les femmes paysannes, en Colombie et dans l’ensemble du monde, afin de forger les processus communautaires visant à garantir la souveraineté alimentaire et la restauration de la biodiversité est indéniable. Elles font toutefois face à de nombreux obstacles en raison du système patriarcal dans lequel elles évoluent, la violence ainsi que les conflits environnementaux. Through their flight from flower to flower and hard work, the women and bees both tell us that honey, like water, is essential to life, and the true gold in the Páramo de Santurbán region. This shows the achievement of a process of popular education, which was based on dialogue and research between communities, and the role of rural promoters such as Laura and Sergio Velasco, who’s advice on honey production was essential. The Andean forests and Santurbán Páramo form a biological corridor of mountains that are sources of water, biodiversity and peasant tradition, and a good ecosystem for beekeeping. The young people in this photo essay are part of the Collective of Peasant and Community Reserves of Santander, a cluster of five peasant associations and 415 rural families, which works to protect forests, biodiversity and water as common resources for rural communities, in northeastern Colombia. Honey is sold in local markets and generates extra income for peasant women. These young women from the Andean jungle decided that beekeeping would be an essential part of building their own alternative economy, based on community conservation. Through the establishment of reserves they have shown that taking care of the Andean forest flora and harvesting a range of healthy foods are compatible. 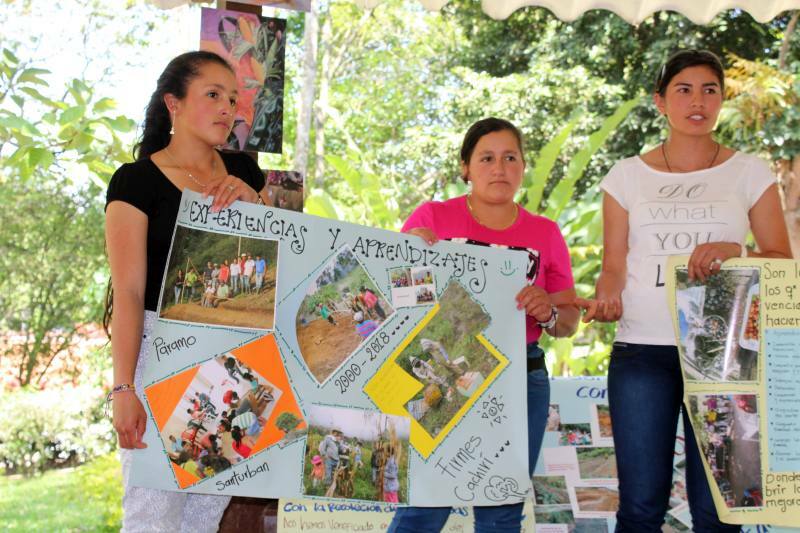 Their achievements are remarkable considering the Colombian context, where uprooting factors are increasingly influencing young people to migrate from the countryside to the city. There are also many barriers in the family and in communities to the participation of girls and young women in training processes and productive alternatives. Research into beekeeping has included monitoring of biodiversity and flowering cycles, which has united peasant families and groups of young people. These young beekeepers have been proactively encouraged to participate in various training activities, mingas (community gatherings to achieve a specific aim) and exchanges, as well as to engage in dialogue with their parents. This helps them to be able to sustain themselves and earn a living from the land, due to the empowerment they receive through the processes, and also due to the improvement in their educational and economic opportunities. Popular education in the region integrates factors of family life, life plans and benefits for girls and young peasants. The « Identification of Special Honey from Colombia with references to its Geographical and / or Botanical origin » contest was organised by Apiarios El Pinar, and supported by Colciencias and the Ministry of Agriculture, November 2018. The multinational Minesa is in the exploration and scoping stages of the licensing process with the aim of starting an underground gold mine in the Páramo de Santurbán. Global Forest Coalition is an international coalition of NGOs and Indigenous Peoples’ Organizations defending social justice and the rights of forest peoples in forest policies.